UNMC › Pathology and Microbiology › Faculty › Bios › Steven H. Hinrichs, M.D. Dr. Steven Hinrichs is Professor and Chair in the Department of Pathology and Microbiology at the University of Nebraska Medical Center in Omaha and the Director of the Nebraska Public Health Laboratory (NPHL), and Director of the University of Nebraska Center for Biosecurity. In his position as laboratory director he has been responsible for the development of a statewide program for the rapid identification of biological agents of mass destruction. 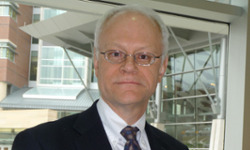 He is principal investigator of multiple national awards from the Association of Public Health Laboratories (APHL) and the Centers for Disease Control and Prevention (CDC) and the Department of Defense for the development of an outreach program to extend training and expertise in the early recognition of biological warfare agents. Dr. Hinrichs is past Chair of the APHL committee on Management and Information Systems and is a strong advocate for further development of communication systems and electronic infrastructure in rural states. Under his direction, the NPHL was one of the first public health laboratories in the country to develop internet-based test ordering and reporting capabilities with the ultimate goal of real-time identification of emerging epidemics. He is currently the national co-leader of the Public Health Informatics Project (PHLIP) that is focused on the harmonization of electronic laboratory messaging practices. Dr. Hinrichs' medical background includes board certification in anatomic and clinical pathology after completion of a residency at the University of California, Davis Medical Center. His research laboratory focuses on molecular diagnostics and the role of viruses in cancer. Dr. Hinrichs has published over 130 papers in basic science and medical journals. Research projects in Dr. Hinrichs' laboratory are focused on three distinct areas of interest: molecular microbiology (please see his webpage for further information), regulation of gene expression and protein structure. A method has been developed for inhibiting tumor specific proteins that initiate cancer in certain types of tumors. The method incorporates knowledge regarding biochemical abnormalities in cells following changes in the chromosome, called translocations. These chromosomal events result in the production of new combinations of proteins that do not exist in normal cells. These combinations, termed chimeric proteins, are optimal targets for development of therapeutic molecules. A similar project is focused on identifying chemicals that could be used as antibodies. The drug target is primase, an essential enzyme that generates abort primers during DNP replication. Significant advances have been made using structural biochemistry and molecular modeling to develop lead compounds that were used to test and develop a model system. This work has lately evolved into a new project focused on inhibiting the activity of essential replication enzymes in bacteria. The project envisions the need for a new class of antibiotics in the future or for antibiotics that can be used to treat genetically engineered bacteria released by terrorists. Molecular modeling was used to suggest targets for mutagenesis and confirmation of function in vitro. The work involves collaboration with a wide range of scientists from electrical engineering to chemistry. A separate project is focused on the development of the next generation of molecular diagnostic tests for the detection and identification of infectious diseases. Class-specific restrictions define primase interactions with DNA template and replicative helicase. Larson MA, Griep MA, Bressani R, Chintakayala K, Soultanas P, Hinrichs SH. Nucleic Acids Res. 2010 Jun 30. Utilization of the QuantiFERON-TB Gold test in a two-step process with the tuberculin skin test to evaluate health care workers for latent tuberculosis. Abdalhamid B, Hinrichs SH, Garrett JL, O'Neill JM, Hansen-Cain KM, Armbrust AA, Iwen PC. J Clin Microbiol. 2010 Aug;48(8):2955-6. Epub 2010 Jun 23. Community-driven standards-based electronic laboratory data-sharing networks. Zarcone P, Nordenberg D, Meigs M, Merrick U, Jernigan D, Hinrichs SH. Public Health Rep. 2010 May-Jun;125 Suppl 2:47-56. Use of rapid influenza diagnostic tests under field conditions as a screening tool during an outbreak of the 2009 novel influenza virus: practical considerations. Sambol AR, Abdalhamid B, Lyden ER, Aden TA, Noel RK, Hinrichs SH. J Clin Virol. 2010 Mar;47(3):229-33. Genetic analysis of the Staphylococcus epidermidis macromolecular synthesis operon: Serp1129 is an ATP binding protein and sigA transcription is regulated by both sigma(A)- and sigma(B)-dependent promoters. Bryant KA, Kinkead LC, Larson MA, Hinrichs SH, Fey PD. BMC Microbiol. 2010 Jan 12;10:8. An outbreak of avian mycobacteriosis caused by Mycobacterium intracellulare in little blue penguins (Eudyptula minor). Napier JE, Hinrichs SH, Lampen F, Iwen PC, Wickert RS, Garrett JL, Aden TA, Restis E, Curro TG, Simmons LG, Armstrong DL. J Zoo Wildl Med. 2009 Dec;40(4):680-6. Molecular identification of Mycobacterium chimaera as a cause of infection in a patient with chronic obstructive pulmonary disease. Bills ND, Hinrichs SH, Aden TA, Wickert RS, Iwen PC. Diagn Microbiol Infect Dis. 2009 Mar;63(3):292-5. Increased hepatotoxicity and cardiac fibrosis in cocaine-treated butyrylcholinesterase knockout mice. Duysen EG, Li B, Carlson M, Li YF, Wieseler S, Hinrichs SH, Lockridge O.Basic Clin Pharmacol Toxicol. 2008 Dec;103(6):514-21. Tyrosines of human and mouse transferrin covalently labeled by organophosphorus agents: a new motif for binding to proteins that have no active site serine. Li B, Schopfer LM, Grigoryan H, Thompson CM, Hinrichs SH, Masson P, Lockridge O. Toxicol Sci. 2009 Jan;107(1):144-55. Epub 2008 Oct 16. Five tyrosines and two serines in human albumin are labeled by the organophosphorus agent FP-biotin. Ding SJ, Carr J, Carlson JE, Tong L, Xue W, Li Y, Schopfer LM, Li B, Nachon F, Asojo O, Thompson CM, Hinrichs SH, Masson P, Lockridge O. Chem Res Toxicol. 2008 Sep;21(9):1787-94.